Expansion joint is device containing a bellow membrane that are designed to absorb dimensional changes, such as those that occur due to thermal expansion or contraction of a pipeline, duct or vessel. The need to solve the problems of thermal expansion are not unique to anyone industry therefore expansion joints are used in a wide variety of market sectors specifically where there is a need to control the movement of pipelines due to changes in temperature. Thermal expansion problems can be solved where the natural flexing of the pipe is practical or where it is possible to install pipe loops however this is not always possible due to economic reasons or the design of modern structures are not capable of taking the loads of flexing pipework. In these situations the design engineer must seek an expansion joint solution. What is Simple Expansion Joint? Bellows are the illustrations of the typical situations for employing Simple Expansion Joint type of Bellows depending upon the application and configuration of the piping profile. The main use of single expansion joint in a piping system is to absorb axial & small amount of lateral & angular movements in which it is installed. A typical arrangement of the above application is shown in the accompanying sketch(Figure-2) below. The Bellow is locked between the end anchors (Main Anchors) and isnormally located close to one of the above Main Anchors. The other end of the Bellow isaccompanied by First Alignment Guide G1 (as close as possible to the below) followed bySecond Alignment Guide G2 at a distance of 14 D (as per EJMA recommendation). TheSecond Alignment Guide G2 is, followed by the Intermediate Guides (located as per thenormal support span) if required as per the length of the line. A typical arrangement of the above application is shown in the accompanying sketch(Figure-3) below. The application of this type is normally not recommended and will performsatisfactory only within certain limits. The axial pressure thrust of the Bellow is transmitted tothe Main Anchor through the offset, resulting into bending moment in the piping. The remaining arrangement of the Main Anchors, First and Second Alignment Guides andrest of the Intermediate Guides remains same as that of the Bellow installed in a straight line. A typical arrangement of the above application is shown in the accompanying sketch(Figure-4) below. The arrangement is generally employed in the situations where the linearexpansion of the line is of a very large magnitude. The Bellow assembly consists of 2elements separated by an Intermediate Anchor. Thereby absorbing the linear expansion ofthe 2 sections of the pipeline individually. It may be noted that the above Intermediate Anchorneed not be designed for the bellow axial force, which cancels out between the 2 BellowElements. The remaining arrangement of the Main Anchors, First and Second AlignmentGuides and rest of the Intermediate Guides remains same as that of the Bellow installed in astraight line. A typical arrangement of the above application is shown in the accompanying sketch(Figure-5) below. The arrangement is similar to that of Double Element Bellow on a straightpipeline except that the middle anchor between the 2 Bellow Elements is required to bedesigned as Main Anchor for the differential axial thrust of the 2 Bellows employed on eachside of the Reducer. A typical arrangement of the above application is shown in the accompanying sketch(Figure-6) below. The middle anchor between the 3 Bellow Elements in this case is requiredto be designed as Main Anchor for the axial thrust imposed by the Bellow of the branch pipe. A typical arrangement of the above application is shown in the accompanying sketch(Figure-7) below. The Bellow is located at 1 end of the longer leg and thereby absorbing thelinear expansion of the longer leg as axial displacement. The Main Anchor near the Bellow isa Directional Main Anchor (DMA), which prevents the pipe end from moving axially, at thesame time allowing the expansion of the shorter leg, which is absorbed by the Bellow as alateral deflection. The Anchor on the shorter leg is required to be designed, only asIntermediate Anchor. The remaining arrangement of the First and Second Alignment Guidesand rest of the Intermediate Guides remains similar to that of the Bellow installed in a straightline to prevent the straight pipe of the longer leg from rotating/ buckling. A typical arrangement of the above application is shown in the accompanying sketch(Figure-8) below. The Bellow is located in the shorter leg and thereby absorbing the linearexpansion of the longer leg as lateral displacement. The Main Anchor near the Bellow is aDirectional Main Anchor (DMA), which prevents the pipe end from moving axially, at the sametime allowing the expansion of the long leg, which is absorbed by the Bellow as a lateraldeflection. The Anchor on the longer leg is required to be designed, only as IntermediateAnchor. Only 1 Guide is required on the longer leg for alignment purpose. A typical arrangement of the above application is shown in the accompanying sketch(Figure-9) below. This is a modified arrangement wherein, by employing a tied Bellow (in theshorter leg) the need of the Directional Main Anchor (DMA) is eliminated. Owing to tie rods thebellow can only absorb lateral deflection (other than its own axial growth) and hence the axialgrowth of shorter leg must be accommodated by the flexibility in the longer leg. Expansion joints come in two forms either restrained or unrestrained styles and although the bellows membrane incorporated in both styles look similar it is of great importance to recognize that they are used for entirely different applications. Metallic expansion joints prevent damage from thermal expansion, vibration and other movements such as building settlement. Metallic expansion joints are generally manufactured from stainless steels or for more demanding environments or extreme conditions can be produced in materials such as Inconel, Incoloy, Hasteloy and Monel. Expansion joints can also be produced from a variety of synthetic rubber materials such as ethylene propylene diene monomer (EPDM), Nitrile, Hypalon and Viton materials. Rubber expansion joints are primarily used on pumps, chillers and other reciprocating machinery to reduce noise and vibration. Whilst rubber bellows have the capabilities of compensating small amounts of axial, lateral and angular pipe work movement Yaang always recommend a specifically designed metallic expansion joint to accommodate pipe movements when solving thermal expansion problems. Are expansion joints the same as movement joints? 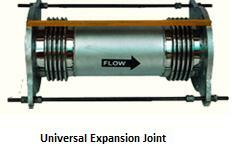 Expansion joints – sometimes called expansion bellows, flexible joints, compensators or movement joints. The variety of terminology for the same piece of equipment can be misleading. However expansion joints are designed to safely absorb dimensional movement changes and therefore the different names given to this critical unit are all related to its ability to accommodate a variety of movements such as expansion & contraction due to temperature difference, vibration due to reciprocating machinery, installation misalignment or building settlement. At Yaang, we offer a vast selection of expansion joints to serve a variety of purposes and are always on hand to provide you with accurate, high-quality advice whenever you require it. Our range of expansion joints includes axial, lateral, angular and gimbal joints. Our expansion joints are designed and calculated to the latest prevailing standards and pressure directives and therefore where applicable conform to latest Expansion Joint Manufacturers Association (EJMA) calculations. We reserve the right to make changes in the technical calculations without notice. All products are supplied with detailed installation and maintenance instructions where applicable to ensure your pipework system is fully in accordance with recommended engineering practice. We oversee a large amount of stock, which ensures we can minimise downtime and respond to your requests quickly. We can supply joints with a bespoke flexible lagging jacket if needed. Why not contact us today if you do have any queries about the products that we supply? More and more discerning clients are heading straight to Yaang when they do require expansion joints of the highest quality. We are renowned for only supplying products of the highest quality that do the job to the best standard possible and are more than happy to talk you through the options available so you can easily come to an informed decision and invest in the products that are right for you. What are Universal Expansion Joints? 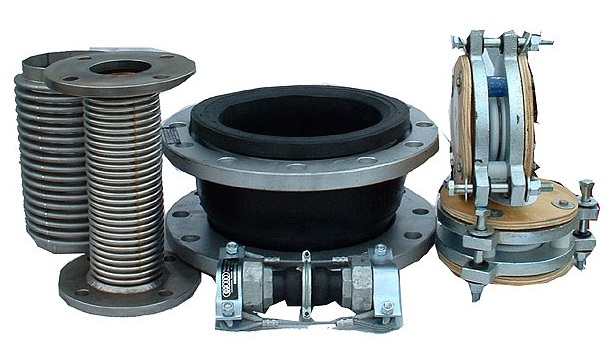 Universal expansion joints contain two bellows with multiple convolutions joined by a center pipe or spool. These joints, also known as double or tandem bellows expansion joints are used for the purpose of absorbing any combination of axial, lateral, or angular movements in a piping system. When lateral movements are too excessive for a single axial expansion joint to accommodate or when there is a limitation on the amount of lateral forces allowed on the connecting piping or equipment, universal expansion joints are installed to accommodate these movements. A typical arrangement of the above application is shown in the accompanying sketch below (refer Figure-10). Typically the assembly employs 2 Bellow elements tied across. The above bellow is purely lateral, and hence the axial expansion of the leg (excluding the expansion of the Bellow itself) housing the Bellow is, required to be accommodated by the Flexibility of the adjoining legs. To prevent the longer legs from rotating necessary Directional Guides are provided as shown. The End Anchors are required to be designed as Intermediate Anchors only. A typical arrangement of the above application is shown in the accompanying sketch (refer Figure-11) below. The arrangement is completely similar to that of the earlier situation except that the Bellow is subject to lateral deflection in a resultant plane derived from the magnitude of the 2 linear expansion components of the longer legs. A typical arrangement of the above application is shown in the accompanying sketch (Figure-12) below. Owing to the limited space between the 2 directly connected equipment nozzles the Bellow is required to absorb axial as well as lateral deflection. In such case the equipment nozzles must be designed to take the axial force due to Bellow imbalance area. The Pantographic linkage is provided to distribute the expansion between the 2 Bellows and control their movements. What are Hinged Expansion Joints? Hinged expansion joints are usually used in sets of 2 or 3 elements to absorb lateral deflection in one or more directions in a single plane. Each element of the assembly is subject to pure angular rotation by its hinge pin. Each pair of bellow element connected by a segment of pipe will act in unison to absorb lateral deflection in much the same way as universal joint in a single plane. The hinges are designed strong enough to take the axial pressure thrust and also to transmit the piping deflections in a plane perpendicular to the plane of hinge rotation. 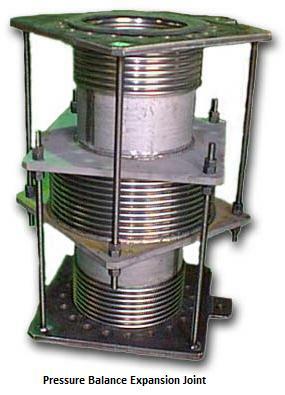 The magnitude of the lateral deflection that could be absorbed by a hinged bellow is directly proportional to the length of spool piece connecting the bellow elements. A typical arrangement of the above application is shown in the accompanying sketch (Figure-18) below. Since the axial pressure thrust is absorbed by the hinges the piping end anchors need to be designed as intermediate anchors only. The position of the pipe guides on the axial pipes should provide adequate flexibility to absorb the expansion of the offset leg housing the bellow. A typical arrangement of the above application is shown in the accompanying sketch (Figure-19) below. The above arrangement is typically employed in the situations where the flexibility in Z shaped profile (in a single plane) is not sufficient to absorb the thermal expansion of the offset leg. What is Pressure Balance Expansion Joint? 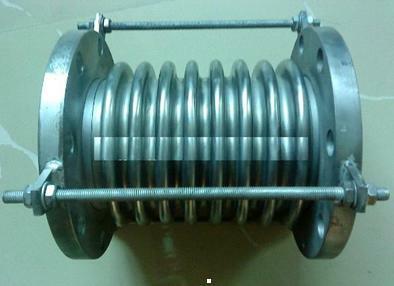 The pressure balance expansion joint or bellow design, which basically is a combination of a Flow Bellow and a Balancing Bellow, comes handy in addressing many situations. The axial thrust imposed by the imbalance area of the Bellow under internal pressure is a main concern in designing the Piping System employing such Bellows. The conventional method of designing such systems is by employing Main Anchors to absorb the above axial force. It is however not always practical (due to space/ access constraints) to achieve these conventional solutions. The excessive magnitude of the axial force could also become prohibitive in some instances. The working principle of the above Bellow relies on the fact that since both Flow and Balancing Bellow have identical cross sectional area, they will produce equal, but opposite in direction, forces under the same internal pressure. If the ends of these Bellows are locked to each other by a suitably designed tie-rod, the above equal and opposite forces will cancel out to transmit no axial force on the end terminals of the connected piping. At the same time the above tie rod will not interfere with the Flow Bellow in absorbing axial/ lateral deflections. 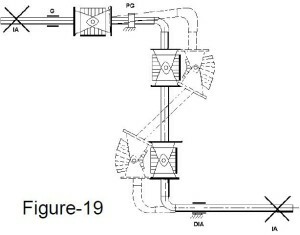 The sketches below show a typical arrangement of 3 such applications (refer Figure-13, Figure-14 and Figure-15 below. In all the 3 cases the Bellow is capable of absorbing primarily axial movement along with a small amount of lateral movement. Since the axial thrust due to internal pressure is cancelled out between the two Bellows the system requires only Intermediate Anchors wherever applicable. A typical arrangement of the above application is shown in the accompanying sketch (Figure-16) below. The above arrangement is typically employed in the situations where the bellow is required to be, installed on a long line without the possibility of installing the Main Anchors. The common balancing Bellow effectively nullifies the imbalance axial force of the 2 flow Bellows, at the same it allows the required deflection to be absorbed within the assembly. The piping end anchors are, therefore required to be designed as intermediate anchors only. A typical arrangement of the above application is shown in the accompanying sketch Fig.17 below. Where large amount of lateral deflections, are involved a Pressure Balanced Universal Joint (with tie rod) may best suit to the situation. By a proper design of the tie rods to rotate around its attachment points it is possible to absorb the lateral deflection by the combination of 2 flow bellows where as the balancing bellow is subject to only axial deflection. What is Gimbal Expansion Joint? The gimbal pipe expansion joint is basically same as the hinge type, except that instead of being limited to deflection in only one plane gimbal Expansion Joints are used to absorb angular rotation in any plane, using two pairs of hinges attached to a common floating gimbal ring. 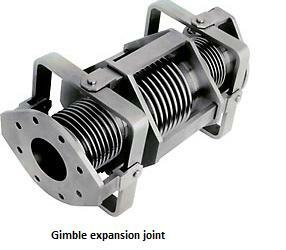 Gimbal systems generally consist of two gimbal expansion joints or two gimbal and one hinged expansion joint/bellow. The advantages of this type of construction is it provides a close control over the movement imposed up on the bellows and also supports the dead weight of the pipe. In addition, the wind and shear loads are also taken care of by the gimbal structure. Gimbal bellows joints are designed to absorb the full pressure thrust load of the expansion joint and thus guard the adjacent equipment from damage due to thrust loading. Since gimbal bellows joints are not restricted to a single plane they offer greater flexibility of usage. The use of gimbal bellows joints results in the best system which eliminates the effects of thermal growth and lowers both reaction forces and installation costs. Expensive main anchors are eliminated and only minimal guiding is required. A typical arrangement of the above application is shown in the accompanying sketch (Figure-20) below. Just as hinged expansion joints offer a great capacity to absorb lateral expansion in a single plane, the Gimbal Expansion Joints offer the same feature in a multiple plane system. 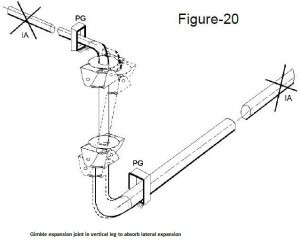 Generally the ability of Gimble Joint to absorb the lateral movement in any plane is best utilized by employing 2 of such bellows connected together by a pipe spool. The structure of the Gimble is adequately designed to absorb the axial pressure thrust and hence the piping end Anchors need to be designed as Intermediate Anchors only. Similar to hinged joint the growth of the offset leg accommodating the bellows must be absorbed by the adjoining piping legs. Metallic expansion joints are designed to safely absorb the dimensional changes of pipework systems and ducts caused by heat induced expansion and contraction. They are essential in pipework systems that are used to convey substances of a high temperature, such as steam, heated water or exhaust gases. Expansion joints can also be designed for other applications, such as noise and vibration caused by reciprocating machinery, building settlement and in some extreme environments earthquake movement. 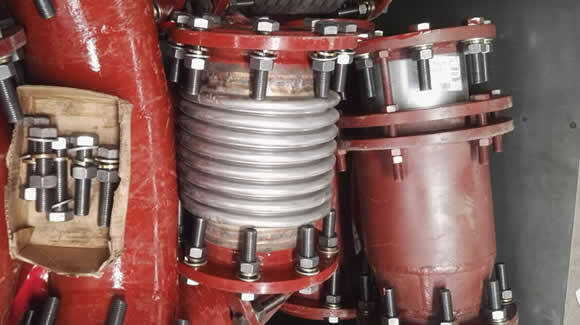 Expansion joints are very important components with in a pipework system as they not only solve the problems associated with pipework movement but offer such advantages as reducing stresses and loads to connecting equipment such as pumps and steam turbines. Metal pipe expansion joints can withstand the design temperatures, pressures, as well as, provide the capacity necessary to absorb thermal growth of the piping system. Yaang offers a wide range of expansion joints, suitable for numerous specific applications. What are Pipe expansion joints? Pipe expansion joints are also known as compensators, as they ‘compensate’ for the thermal movement. Pipe expansion joints are necessary in systems that convey high temperature commodities such as steam or exhaust gases, or to absorb movement and vibration. A typical type of expansion joint for pipe systems is a bellows which can be manufactured from metal (most commonly stainless steel), plastic (such as PTFE), or an elastomer such as rubber. A bellows is made up of a series of one or more convolutions, with the shape of the convolution designed to withstand the internal pressures of the pipe, but flexible enough to accept the axial, lateral, and/or angular deflections. Expansion joints are also designed for other criteria, such as noise absorption, anti-vibration, earthquake movement, and building settlement. Tube – A protective, leak proof lining made of synthetic or natural rubber. The tubes primary function is to eliminate the possibility of materials being handled penetrating the carcass. Carcass – The carcass or body of the expansion joint consists of fabric, and when necessary metal. Cover – The exterior surface of the joint. Fabric Reinforcement – The carcass fabric reinforcement is the flexibility and supporting member between the tube and cover. Metal Reinforcement – Wire or solid steel rings imbedded in the carcass, often used for strengthening. 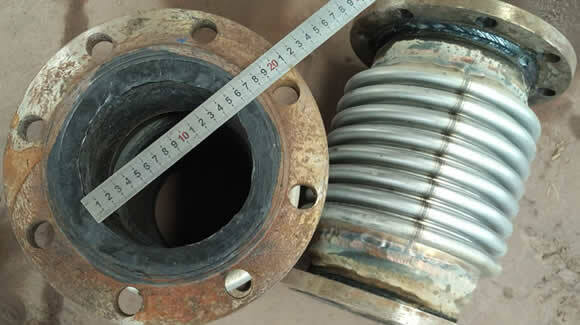 Retaining Ring – Used to compress the expansion joint flange to the mating flange to create a seal. Also called clamp bars or backing bars. Applies to most all expansion joints. Mating Flange – Used to connect the pipe joint to the pipe in which it is being installed. Control Rod – Used to limit the axial movements during operation, and prevent the joint from exceeding its movement capabilities. The rods attach the mating flange and expansion joint. Typically used on piping joints, but can be installed on most any joint when required. Expansion joints are an assembly designed to safely absorb sound, expansion, con traction and vibration to ensure expansion jointsthat the application stays in fully working order. When we apply this technique to pipe systems, we brand the term ‘pipe expansion joint’ or ‘bellows’. These pieces of equipment are used in pipe work where movement, thermal expansion and much more could cause problems. The pipe expansion joints are made up from one or more convolutions, which are designed to move or expand to relieve the stress from the solid pipe. The amount of movement or expansion within the application will determine the number and shape of convolutions required. 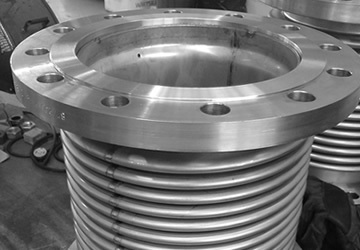 Expansion joints can be manufactured from a range of different materials, from stainless steel and PTFE, to rubber. Pipe expansion joints are also designed for other criteria, such as noise absorption, anti vibration, earthquake movement and building settlement. Metal expansion joints have to be designed according to rules. Pipe expansion joints are used in a number of industries, including; oil, petrochemical and paper industries. Pipe expansion joints are often manufactured to withstand temperatures from minus 300°F, up to 4000°F, as well as being able to resist at full vacuum or 2000 psig. Expansion joints can be manufactured from a range of different materials aforementioned. Before the introduction of pipe expansion joints, engineers were battling with the task of combating problems regarding thermal expansion, corrosion and abrasive factors that took effect on the functionality of various applications. Fabric joints can be used in a number of applications for turbines and pipelines, which can defend against resistance, heat and a range of other environmental factors. Pipe expansion joints are crucial components in the pipe technology sector, which serve a huge number of industries. They are used to counterbalance length changes that generally occur in pipelines from temperature changes and can also absorb vibrations. It is a cost effective solution to increase the life span, reliability and costs of many applications through equipment and process management. When the space constraints do not permit providing adequate flexibility by conventionalmethods (e. g. expansion loops etc.) for maintaining the system stresses withinacceptable limits. When conventional solutions (e.g. expansion loops etc.) create unacceptable processconditions (e.g. excessive pressure drop). When it is not practical to limit the piping induced loads on the terminal nozzles of theconnected equipment within admissible limits by conventional methods. When the equipment such as Compressors, Turbines, Pumps etc. necessitate isolatingthe mechanical vibrations from being transmitted to the connected piping. The end anchors in a piping system employing a Bellow requires special considerations owing the large imbalance axial force generated due to internal system pressure acting on the bellow convolutes. At the same time the inherent weakness of the Bellow to transfer the longitudinal force across its ends. It is therefore imperative that a proper assessment of the imbalance Pressure Thrust of the Bellow and its effects on the piping end terminals be evaluated prior to using the Bellow on a piping system of large diameter and sizable internal pressure. The above longitudinal force is carried in tension in the Pipe wall and the system remainsstable with the opposite and equal force acting at the capped end balancing each other. 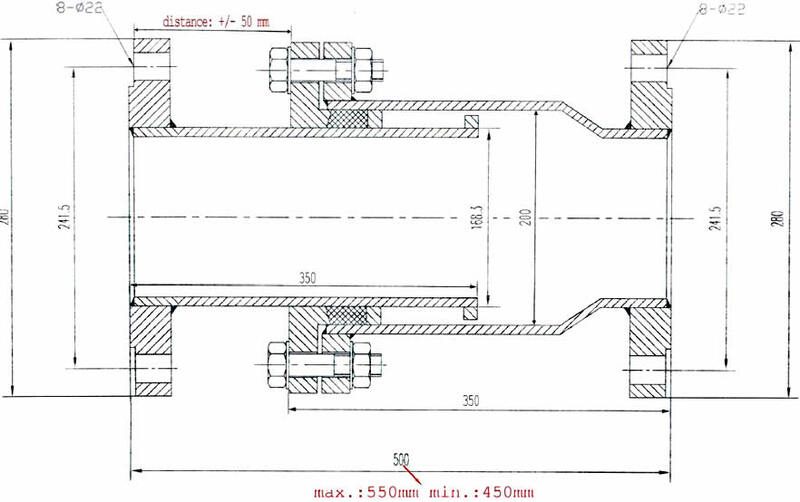 Nowlet us introduce a Bellow in the middle of the above pipe section (refer Fig 1B). Since the above Bellow does not have any appreciable longitudinal stiffness it will tend to straighten outas shown in Fig 1C below resulting into rapture of the convolutes. It is therefore necessary toprovide end anchors (refer Fig 1D below) to counter the pressure force acting at the endsand thereby stopping the bellow convolute from flattening. The magnitude of above force willbe combined longitudinal force acting at the Bellow inside diameter and the imbalancepressure thrust acting on the side-wall, of the convolute. P = System internal pressure. Expansion joints have rectangular sections and waveform with similar shape. A single expansion joint in the pipe bears two-dimensional displacement. The pipeline comprising two expansion joints can bear three-dimensional displacement. Metal expansion joints could be classified into full-height expansion joints and half-height expansion joints. 1. After the user pick the appropriate expansion joint in accordance with the thermal displacement of the piping system, they have to provide details about the medium from the pipe, design pressure of the duct, the greatest temperature during operation, the general dimension of sections of the duct, the chosen waveform and the quantity of the waveform to be able to design and manufacture structure of expansion joints. Full-height type: △α = ± 24 mm Half-height: △α = ± 12 mm. 3. The ash board: For pipes with less dust, the ash board doesn%u2019t need to be utilized for flue pipes with much dust, the ash board ought to be adopted. 4. In order to reduce the number of the waveform, we have to take into account the cold-drawn process for expansion joints. 5. Expansion joints are suitable for pipes whose cross-sectional areas are less than 4.6 square meters and one side of the overall dimension of the air and flue gas duct which is less than 1.5m but greater than 0.6 mm. Standard full-height expansion joints can be applied to all air and flue gas ducts.